Buying a used car can feel a little like a crap shoot. Is the car you have your eye on really worth the thousands you're going to spend on it? Or will you find it's held together with Band-Aids and twine after driving it off the dealer's lot? Before you even start debating the relative merits of a sedan versus an SUV, you need to ask yourself some important questions. These are going to be the basis of your used car purchasing decision, so don't think you can skip over them to get to the part where you're salivating over pictures of cars online. 1. How much work am I willing to do to get a deal? 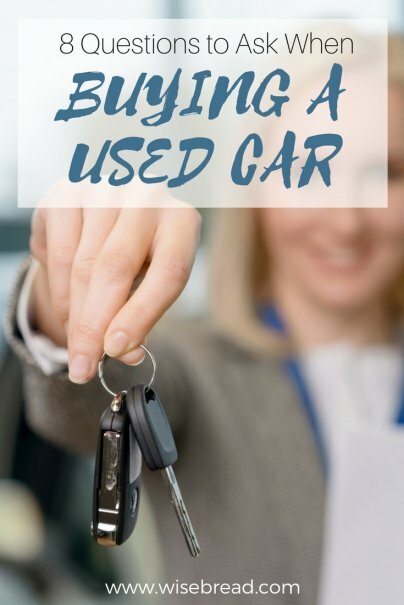 When you buy a used car, you can spend money and save time by making a purchase from a reputable local dealer — or you can spend time and save money by buying direct from a local private seller. And whether you purchase from a dealer or a private seller, you can often find better deals if you broaden your search to include nearby cities. This is why it's a good idea for you to recognize whether you have more time or more money at your disposal. If you know that you are not willing or able to devote a great deal of time to your search, you might not find the best price possible. And if you don't have a great deal of money to spend, your search might take longer while you try to find the right price. Whether you plan to pay cash for your used car or you expect to take on an auto loan, you need to start with a good look at how much car you can afford. According to the 2017 Edmunds Used Vehicle Market Report, the average price of a used car was a whopping $19,189 in 2016. If you don't have the full cost of your new-to-you car saved up, make sure you have calculated the monthly cost of financing the vehicle. For instance, let's say you have $4,000 set aside to put down on a $19,000 car. A 48-month loan of $15,000 at 3.24 percent interest will cost you $334 per month. Of course, your monthly car payment is not the only cost associated with buying a car. You will also need to calculate your insurance costs, since different vehicle models can have different insurance premiums. In addition, different vehicles can require varying levels of maintenance and the cost of parts, labor, and repairs can be higher or lower depending on which car you choose. Taking the time to figure out your car shopping budget, as well as your insurance and maintenance budget, can help you zero in on the right make and model for your finances, even before you start looking for the specific car you want to buy. 3. How will I finance this purchase? If you are planning to take on an auto loan, don't wait until after you've found the car you want to get your financing in place. Whether you are purchasing a car from a dealer or a private seller, having your financing secured ahead of time gives you an important bargaining chip. You will be empowered to negotiate with the seller in the same way that a cash buyer could. You will not be stuck with the terms offered by the dealer's financing options, and you will make it clear to a private seller that you are a motivated buyer. To find the right loan, you can shop around among banks and credit unions for the best rates and terms. Doing this ahead of time will also allow you to make rational decisions that aren't motivated by lust for a particular vehicle that is calling your name. Now we get to the fun part. You've figured out your budget, so you can start looking online at local (or not-so-local, if you're willing to travel for a deal) used cars for sale. But rather than just make a list of possibilities in your price range, don't forget to do a little research on the particular makes and models that you are planning to test drive. 4. What are common problems with this make and model? Automotive engineers and manufacturers are not perfect, which means there can be common problems with certain models that are predictable if you know a little about the brand. For instance, Honda Accord V6s released between 1999 and 2004 have a widespread transmission problem that often requires an expensive transmission replacement. While not all common problems are as costly as this one, it is always a good idea to know as much as possible about the known complaints about your potential purchase before you even go for a test drive. If Google is not coming up with answers, consider finding a car enthusiast forum for the particular make and model you're looking to buy. Ask these friendly folks for some insight. 5. Can you tell me about any recent maintenance or repair? A used car has a history, which means there must have been some maintenance, and possibly some repair. You want to find a seller who is able to tell you what kinds of maintenance and repairs were recently done. If the seller claims that the 10-year-old vehicle you're interested in has needed nothing but oil changes, that could be a red flag, particularly if you know what common problems crop up on that make and model. 6. Can my mechanic look at the vehicle before I make my final decision? If the answer is anything other than yes, hang up the phone and move on. 7. Did the owner do a good job of maintaining this vehicle? A well-made car that was poorly maintained may be a worse bet than a mediocre car that was lovingly maintained. Your mechanic will be able to tell you if the previous owner stayed on top of necessary regular and irregular maintenance. 8. Did the previous owner use cheap parts or good parts? Not all car parts are created equal. A previous owner who did repairs with low-quality, cheap parts may have done a disservice to the car (and the next owner). Other than taking the car completely apart, there will be no way to know if all replacement parts were high-quality — but asking if the easy-to-check parts are good quality can be a decent indicator that the previous owner took good care of the vehicle.